Coffee Maker With Mug Just $21.96! Down From $40! PLUS FREE Shipping! You are here: Home / Great Deals / Amazon Deals / Coffee Maker With Mug Just $21.96! Down From $40! PLUS FREE Shipping! Hurry over to Amazon where you can score this Personal Coffee Maker With 15 oz. Mug for just $21.96 down from $39.95 PLUS FREE shipping! Built to last, this appliance is made using high-quality materials to provide long-term strength and use. 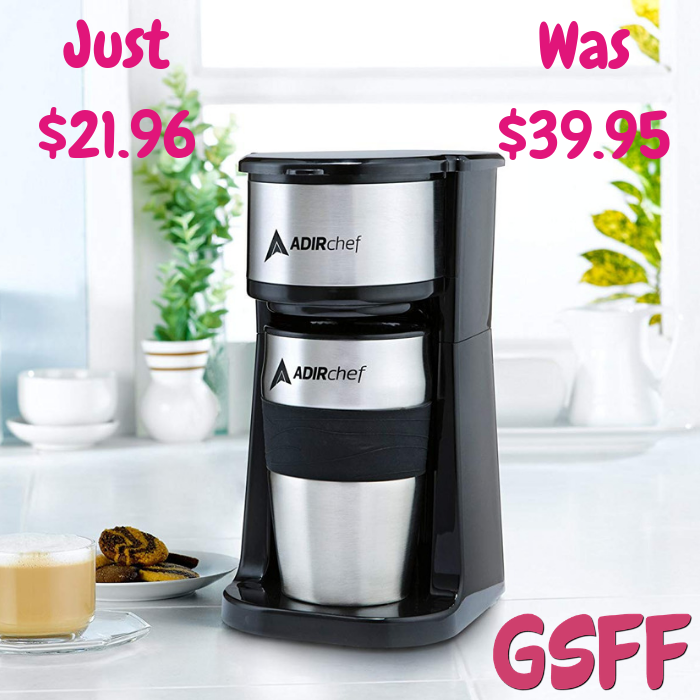 The coffee maker is made out of durable plastic and the 15-ounce travel mug is made out of stainless steel,allowing you to enjoy a great cup of coffee every morning for years to come. Small and lightweight, this unit can be easily transported from one location to another. It’s the perfect size for tight counter spaces in your home or you can set up your own personal maker in your cubicle at work. If you prefer to set up the appliance at home, then you can just grab the mug and take your coffee to go after it’s brewed. It makes a great gift too!